In an age of worrying climate change and looming fossil energy decline, the benefits of biogas are obvious. Its no longer a matter of proving the many benefits. The challenge is now to rapidly increase the adoption of the process, wherever there is a source of waste biomass. This is essential to reduce the impact of man on the global ecology. 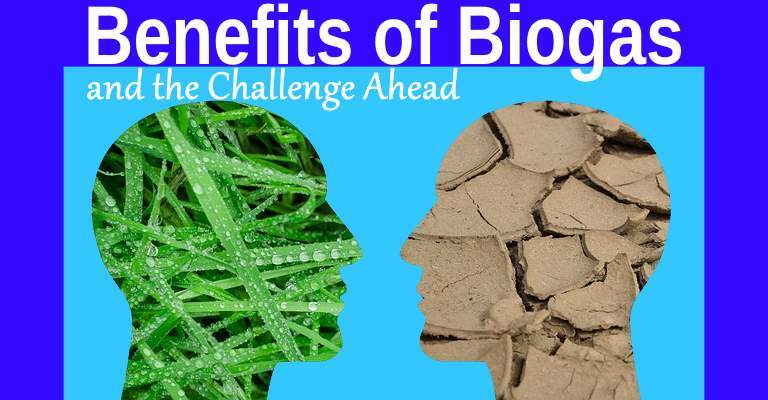 Benefits Proven: Brings the Need to Publicize Biogas. Even without fossil energy decline, the benefits of biogas are in fact clear. But, let us state what those benefits are, just in case the readers of this article are unaware. As a gas, the direct benefits of biogas are similar to the benefits of natural gas. When purified to a high level biogas which has been upgraded to biomethane can be injected into gas grids to supply home and businesses. In theory, another of the benefits of biogas, is that it can be used as fuel in nearly all types of combustion engines. These include as gas engines (e.g. the Otto motor), diesel engines, gas turbines and Stirling motors etc. Biomethane can also be used as a transport fuel, achieving significant environmental and cost savings in HGVs, buses and other vehicles, compared to diesel vehicles, while also playing an important role in improving poor air quality in our towns and cities. That same gas can be compressed at service stations to provide CNG to power heavy goods vehicles. The benefits of biogas here, is that his would rapidly provide for refueling to be made available. This can be done while the cost of very high efficiency batteries is reduced after the time when such batteries can actually hold the necessary charge without excessive weight, for HGV use. In a much wider sense, they include not only the production of renewable energy that substitutes the use of fossil fuels, resulting in carbon dioxide (CO2) emission reductions. But, also benefits associated with the handling of manure. In addition the biogas process (known as anaerobic digestion) produces a wonderful set of fertilizers. But, the output from a biogas plant can also go further than that and be called a soil-improver. That’s because the solid output includes soil improvement fibers, which can can raise the fertility of vastly depleted soils. This is important because most chemically fertilized soils, badly need the carbon content to be raised within them. To go into a little bit more detail: One of the benefits of biogas is that making it creates digestate. Digestate can be produced to three specifications; whole, liquor and fiber. Acidogenic digestate can also, for example, be used as an environmentally friendly filler to give structure to composite plastics. Almost all macro- and micro-nutrients are conserved during anaerobic digestion. Therefore, high-quality digestate can be ensured by feeding AD plants with high-quality substrate, such as source separated organic waste. Digestate can be used whole, spread on land with tankers or umbilical pipe lines. It is accepted that care is needed that digestate that is used on land does not spread infections, or create a toxic substance build-up over time. The input material largely determines whether or not compost or digestate can be used on your land. If the only waste feedstock to the anaerobic digestion process is farmyard manure or slurry only, most environmental regulators accept that the digestate can be spread on agricultural land as a fertilizer or soil conditioner without being regulated as waste. Biogas can be produced from raw materials such as agricultural waste, manure, municipal waste. Also, plant material, sewage, green waste or food waste. It can be combusted to provide heat, electricity or both. It can be compressed, the same way as natural gas is compressed to CNG, and used to power motor vehicles. It can be ‘upgraded’ to pure methane, often called biomethane, by removing other gases. Biogas can be produced with various types of organic matter, and therefore there are several types of models for biogas digesters. None of those models however is anywhere near as efficient as a cow. To be that good at digesting organic matter today’s best biogas plants would need to be at east 15 times more efficient. There is every prospect that man will learn from the cow and get far better at the AD process. When that happens the profits to be made form biogas will be absolutely amazing! The use of biomethane can unburden electricity networks everywhere, and contribute to a temporary easing of cost-intensive High-Voltage national grid upgrading work. Biogas plants are small compared to fossil-fuel power plants. When used to generate electricity and heating, they do so within smaller decentralized combined heat and power plants. The result is that much more of the electric power they produce is used locally. This reduces power distribution cost which is due to the electricity warming up power lines a tiny amount as it flows through them. The technology also creates employment in the rural areas where work can be much needed. Is Enough Biogas Being Made to make a Difference? Yes. Billions of cubic meters of biomethane from biogas are already being produced on a yearly basis. Thus, one more of the benefits of biogas is it’s facilitating role toward a significant reduction of fossil fuel dependency. It is a renewable energy source that substitutes the use of fossil fuels, resulting in carbon dioxide (CO2) emission reductions. Can I Use Biogas Technology in my Home? Yes. In fact, home biogas creation and use, seems to be taking off. As it can be used in similar ways as natural gas in gas stoves, lamps or as fuel for engines, home biogas generation makes sense. 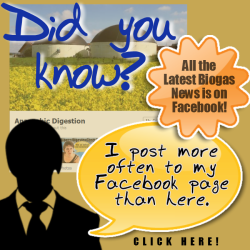 Support the movement toward biogas production and anaerobic digestion. It makes sense to do that. Of all the important renewable energy technologies which can really make a difference to our global future, biogas and the anaerobic digestion process which creates it, is the least well-known. It isn’t the easiest of technologies for the media to write about. The concept of using waste, such as dung, and sludges, is distasteful to many editors. Who can blame them! Some readers no-doubt would prefer not have to ever think about such down-to-earth subjects. 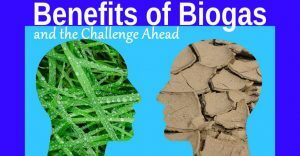 The challenge is therefore, for people such as you, our reader to appreciate the benefits of biogas and the anaerobic digestion process, and to join with us in publicizing this amazing technology which can do so many uniquely useful things. Useful things which, in many ways, are also vitally important things. Biogas is a renewable, as well as a clean, source of energy. Gas generated through biodigestion is non-polluting; it actually reduces greenhouse emissions (i.e. No combustion takes place in the process, meaning there is zero emission of greenhouse gasses to the atmosphere; therefore, using gas from waste as a form of energy is actually a great way to combat global warming. Unsurprisingly, concern for the environment is a major reason why the use of biogas has become more widespread. Biogas plants significantly curb the greenhouse effect: the plants lower methane emissions by capturing this harmful gas and using it as fuel. Biogas generation helps cut reliance on the use of fossil fuels, such as oil and coal. Anaerobic digestion of livestock manure and organic food residuals provides security to the agricultural/ food sector. Biogas is a green energy source in form of electricity and heat for the local grid. Considerable environmental advantages – less emission of the greenhouse gasses methane, CO2 and nitrous oxide. Environmentally friendly recirculation of organic waste from industry and households. Less odour inconveniences when spreading slurry on the fields – fermented slurry smells considerably less than normal slurry and the smell decreases faster. Cooking on biogas is faster and easier than cooking on charcoal or firewood. Biogas stoves do not take time to heat up, so as soon as you’ve turned on the stove you can start cooking! Biogas is a modern source of energy for cooking and lighting. It is quick, easy and clean. Cooking on gas keeps your kitchen clean and tidy, and protects your family from the dangers of indoor air pollution. Biogas systems convert organic household waste or manure into gas for cooking and lighting. This waste can be leftovers (rice, ugali), vegetables (tomatoes, cabbage), peels of potatoes and fruit, etc. Instead of throwing this away or leaving them (which will attract insects and pests), you can use it to produce energy! Biogas helps you to manage your waste and contributes to improved hygiene. Anaerobic digesters can destroy more than 90 percent of disease-causing bacteria that might otherwise enter surface waters and pose a risk to human and animal health. Odors from anaerobically digested manures are significantly reduced compared with odors from typical storage and land application. Looking for ways to diversify revenue is critical to the long term financial viability of many farms. While manure has always traditionally been a resource on the farm as a fertilizer, alternative products can be produced creating new income generating opportunities. Maximizing the value of manure increases farmers’ resiliency to the uncertainty of commodity product markets. “Tipping fees” received for the management of non-farm organic waste streams. This not only boosts direct revenues, but provides additional biogas for energy production. Organic nutrients from the liquid and solid by-products of digested manure. These can be used both on-farm or sold to other local or regional agriculture and horticulture sources. Animal bedding or peat moss replacement from digested solids. Biogas produced from the breakdown of the manure. Biogas is a source of renewable energy for electricity, heat, and fuel for on-site use or sale to the local grid. Products created from manure lessen our dependence on finite resources such as phosphorous, petroleum and peat moss. As farmers look to innovative ways to economically and environmentally manage their manure, there are opportunities for rural economic growth. Local expertise in contracting, site work, concrete, plumbing, electrical, permitting, and engineering during planning and construction. Skilled labor to keep the system running at optimal levels once operational. Businesses built around nutrients, manure solids, and energy markets. Cooperative business models can share the risk and reward across farms and private investors. Agro-tourism: advanced manure management has served as a springboard for people to visit farms, where they learn more about environmental improvements and where their food comes from. Fair Oaks Farms in Northwest Indiana doubles as an agricultural science center as well as an opportunity for the public to see where their food comes from. The farm’s attractions include tours of their dairy and swine operations as well as a restaurant. The farm is planning to expand with an on-site hotel to accommodate the more than 600,000 annual visitors. Healthy soil and water is important to farmers, their families and the community. The vast majority of farms in America are family-owned and active conservation practices, aided by the use of anaerobic digestion (biogas plants), can continue to pass this legacy from one generation to the next. Biogas plants improve soil health by converting the nutrients in manure to a more accessible form for plants to use. Help protect the local water resources by reducing nutrient run-off and destroying pathogens. Many early farms and other agricultural operations, such as mills, were often energy independent, getting their power from wind or water sources. Manure provides an opportunity for farm energy independence. Biogas from manure is composed of more than 50% methane, the primary component of renewable natural gas. Meet on-farm energy needs. Biogas can be used to generate electricity for lighting barns or houses, heat for warming barns and on-site greenhouses, energy for cooling milk, and fuel for running on-site vehicles. It allows the farmer to operate ‘off the grid’ and reduces reliance on utilities. Provide energy to the local grid. This can help the local utility meet growing energy demand with locally sourced renewable energy. Reduce greenhouse gas emissions by capturing methane gas that may otherwise have been lost to the atmosphere and by displacing fossil fuel energy use. A remarkable amount of CO2-reduction credits can be earned in the cases where not only the production of renewable energy but also the recovery of methane gas from wastes is considered when evaluating the total impact of the project to the global warming. A biogas plant produces fertilizers that are hygienically safe and their nutritive values are better than synthetic fertilizers.